Ocontemporary announce the launch of their permanent new home at 193 Wardour Street, London, W1. Over 2000 ft.sq. of impressive exhibition space allows for two major exhibition areas, the ground floor will host their exciting exhibition program and there are plans for the lower ground to always show a varied selection of their artists' work. Continuing on a Brazilian tip Ocentemporary will have the first uk solo by the highly sought after Titi Freak in their new London space. 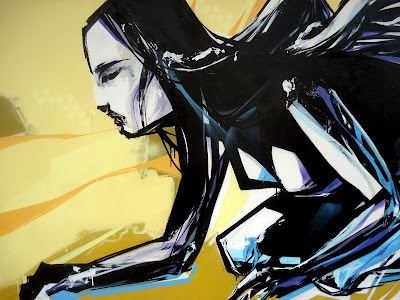 Titi Freak is one of the key players emerging from the hugely important Brazilian school of street art, a genre recently described by The Times as 'the most significant in the global urban art movement'. The creativity and authenticity of the work emerging from Sao Paulo is fast making the city to the street art movement what New York was to Pop in the 1960s. Alongside Titi Freak, in the lower ground exhibition area, they will be showcasing work by new and established talents including Carlos Dias, John Simpson, Gerald Laing, Jann Haworth, Tinho, Speto, and Anderson Resende. The show opens to the public on the 5 September and will run until the 4 October. There will be a private view party on thursday 4 september, 6pm to 9pm.